Swann-Morton apply the same cutting edge expertise and quality control checks to their Professional range craft products as they do their World famous surgical blades. 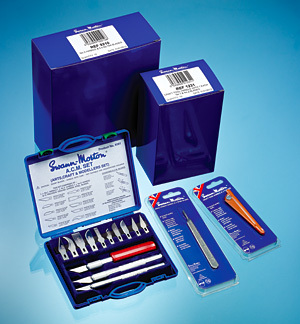 The range incorporating the ACM-Arts, Craft and Modellers products, traditional craft knives and surgical No.3 and No.4 fitment knives were recently re-launched in an attractive, user friendly point of sale clam packs. The clam pack has allowed us to standardise the pack sizes with the exception of the ACM set which is housed in a neat but robust carrying case, moulded in blue, emblazoned with the Swann-Morton Logo and secured with two green plastic clips to hold the box firmly shut. This will hopefully assist our retail customers in formulating their planogram for the available display space at each outlet thus minimising the gaps and optimising potential returns. The discreet incorporation of the Union Jack into the packaging design reinforces the pride that Swann-Morton has in still manufacturing their products in Sheffield, England.